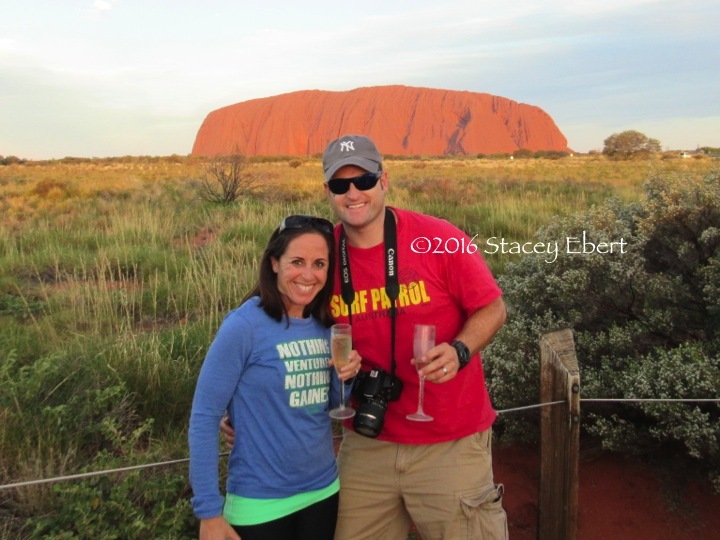 Two months ago, we set off on a few weeks adventure in Australia. After time in Melbourne with family and friends, we ventured into the Northern Territory’s Australian Outback for a few days full of mineral-rich red dirt, countless open expanses and Aboriginal heritage embedded in astounding rock formations. Tracing the footsteps of Jiles, Goss and Lasseter, travelers continue to flock to the Red Centre annually. Depending on your time frame, how much you’d like to spend and where you’d like to sleep, the possibilities are endless and no matter what, the skies filled with sparkle. Smack dab in the center of the continent, sits Alice Springs. Formed when the explorers needed repeater stations every 250 kilometers (in order for the telegraph lines to work to speak to the Queen of England), Alice Springs is one of the largest towns in the Red Centre. Situated on the Todd River, Alice Springs’ economic mainstays are tourism, farming and mining. Housing ethnic restaurants, a few supermarkets, Aussie fare, a Subway®, Gloria Jeans®, shops, local artist creations and tourism offices, Alice Springs is a hub for Outback excursions. Many of the journeys are obvious. The city, set amid a semi-arid dry zone, is a major fly and drive destination where travelers pick up tours headed to Uluru (Ayers Rock), Kata Tjuta (the Olgas) and Watarrka (Kings Canyon). These majestic destinations are over 440 kilometers from Alice and are difficult to fully digest in one day. If you’ve got a few days to spend, there are hours of learning, hiking, Aboriginal culture and entertainment found within the surrounds of these incredible formations. 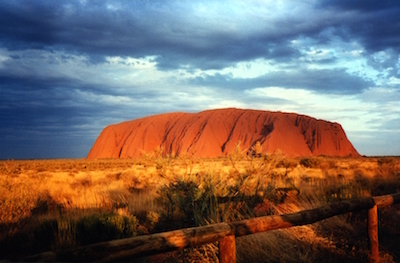 Hike around Uluru at sunrise to watch the colors arise out of nowhere or sip a sundowner in the evening as the sky darkens around the ever-present rock. Brave the inclines of Kata Tjuta (which means lots of heads) to witness the auburn-coloured vista and rocky terrain. Or spend the day amidst the Gardens of Eden at Kings Canyon as the colours change from red to orange to yellow the further into the canyon you hike. Amidst the rock, there are a plethora of stories to uncover and lessons to learn. The Aboriginal culture is revered in this area. There are places with cave history, lessons detailed in the caverns or slopes of the giant rocks and even times along your hiking paths that photos are not allowed due to the sacred location on which you’re standing. All who visit can feel the spiritual depth of the region. Erldunda Roadhouse, situated in the middle of a cattle station, is a highlight in the center of Australia welcoming travelers headed into the Outback. Equipped with Internet, a bar, restaurant, shops, animals, toilets, photo worthy stops and an Emu farm, Erldunda is a welcome sight for weary journeyman. When you finish your pie and sausage roll, head out back to visit with Australia’s largest raptors, the Emus. Check out the texture and weight of an Emu egg that looks like a life-size Christmas tree ornament. Watch the Emus check out the humans as each look each other in the eye while munching on snacks. And if you’re up for an adventure, ask the keeper if you might be able to head into the enclosure and feed the birds. Their large beaks gently nip at your palm as they grab their feed. For a real treat the keeper will plop you in the center of the birds, drop vegetables and fruit around your feet as the birds dive straight towards you forming a giant circle around your every exit as they happily eat their treats. Standing amidst these incredible creatures is an experience to remember. If you’re plopping down in Alice Springs for a few extra days, there are some other items to add to your travel to-do list. If your legs can still muster up the strength to wander an incline, check out Anzac Hill lookout. The originally dedicated WWI memorial now serves veterans of all wars and is the most visited site in Alice Springs. It’s free to enter and feel free to head towards the top for a view overlooking all of Alice. If you have a bit more time and $15, take in a tour of the museum of the Royal Flying Doctors Service. For only a few dollars, visitors learn the entire history of the service, about it’s founder (John Flynn) and the progress that continues to flourish today. Delivering emergency services, ambulatory transport, primary and preventative medical services to millions of Australian in remote areas, today the Royal Flying Doctor’s Service operate over 20 bases around rural Australia. Lifesaving services and transport happen regularly with the well-trained doctors and nurses aboard each airplane. Between 1928 and today, with medical services, aircrafts and staff, the service has been a game-changer to the lives of millions around this beautiful land. The husband, who grew up in a suburb of Melbourne had never visited the Outback before this trip. This visit, the local people and something about the strong spirit of this area of land really touched us both. Everywhere you step, you can feel the strength of the Aboriginal spirit, listen to the lessons of the land and learn something about yourself in the process. According to legend, one of the most significant skills young Aboriginal children can learn in the Outback, is patience. Out of patience, grows all of the other lessons. With patience, one can learn, progress, listen, seek, find and grow. Bring a fly net and visit the Red Centre; your memory card and view of the world will never again be the same.